The Field Building Leadership Initiatives (FBLI): Advancing Ecohealth in South East Asia is the 5 - year (2011-2016) project funded by the International Development Research Center (IDRC), Canada and implemented by eight different partner institutions within the SEA region namely the Health Systems Research Institute, Nonthaburi, Thailand (http://www.hsri.or.th/en ), the Kunming Institute of Botany, Yunnan, China (http://english.kib.cas.cn ), the Kunming Medical University , Yunnan, China (http://www.kmmc.cn/kmmc/default.aspx ), the Mahidol University, Bangkok, Thailand (http://mahidol.ac.th ), the University of Indonesia, Jakarta, Indonesia (http://www.ui.ac.id/en ), the Veterinarians Without Borders, Victoria, Canada (https://www.vetswithoutborders.ca ), and the Hanoi School of Public Health, Vietnam. Conducting transdisciplinary, multi-country, multi-institutional, gender-sensitive and participatory ecohealth research to address human health problems related to agricultural intensification. Strengthening the capacity within SEA for ecohealth research and practice by developing institutional capabilities to deliver ecohealth training, provide a range of training materials and course offerings, and mentor early-career professionals to build leadership and expertise in the ecohealth field. Engaging key policy makers – at local and national levels – to interact with the ecohealth research teams, sites and communities to ensure that the emerging research findings will inform and positively influence policy and practice in the field. The FBLI program will feature four interlinked components that correspond to our program objectives. The research component will serve as the backbone of the initiative, providing sites and substance for the capacity building, knowledge translation and networking components – which in turn will feed back into and strengthen the research work. Ecohealth is well-positioned to become a sustainable dynamic field in the region beyond the life of the initiative, led by a new generation of ecohealth researchers and practitioners. Groundbreaking research findings and practical solutions have emerged from site-based ecohealth research conducted in at least four Southeast Asian countries, underpinned by participatory action research approaches to locally defined problems and issues. 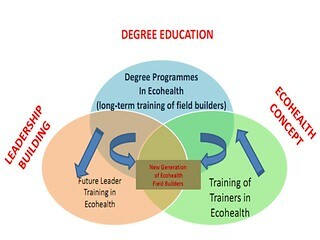 A robust and critical mass of training materials and pedagogy, regional cases, best practices, and regional short courses and degree programs – developed in collaboration with partners, master trainers and mentors – are available for future use and adaptation by a range of stakeholders at local, national and regional levels. Strong and enduring linkages among policy makers and researchers are established, enabling the effective uptake and use of research findings and evidence in policy formulation and implementation.